Happy Crowleymas, the feast of the Beast, the birthday or 143rd anniversary of, the birth of Edward Alexander Crowley. Also known as Aleister, Beast, Perdurabo, To Mega Therion, et al. It is for me a day to celebrate the body of work he left behind. It is, as those who dig into it well know, truly profound and so many layered. As is the man himself: a prophet, scholar, poet, magician, explorer, raconteur, yogi, astrologer, artist, meditator, channel, and also a human being with all sorts of controversy associated with his human flaws. As Yoda says, “Ahead of his time, he is.” While I don’t agree with everything he did or said (and some things make me cringe), I have profound respect for his contributions to this world. His output of magickal work is nothing short of stunning. I thank him for all the works he created in his lifetime, especially the holy books that have brought me so much joy to be alive in this time when so much is possible. As I begin to write this, it is actually Crowleymas Eve. A good time to reflect on how to properly celebrate. I pulled out my copy of Perdurabo, the biography by Kaczynski, with the idea to chip away at reading it again, starting on Crowleymas. It is a massive brick of a tome, making the title (Perdurabo, meaning the equivalent of “I endure til the end”) something I smile at as I contemplate reading it in entirety again. I’m also re reading Lord of the Rings now, so I can alternate into fantasy when the biography gets too dense. Speaking of holy books, here is a picture of a copy of Liber AL vel Legis, the Book of the Law, a standard paperback version I took apart, page by page, then rebound. Just like the verse instructs, I glued left and right pages together before folding them into signatures and sewing them with coptic stitch between handmade covers. I made this one as a gift for a fellow Thelemite. 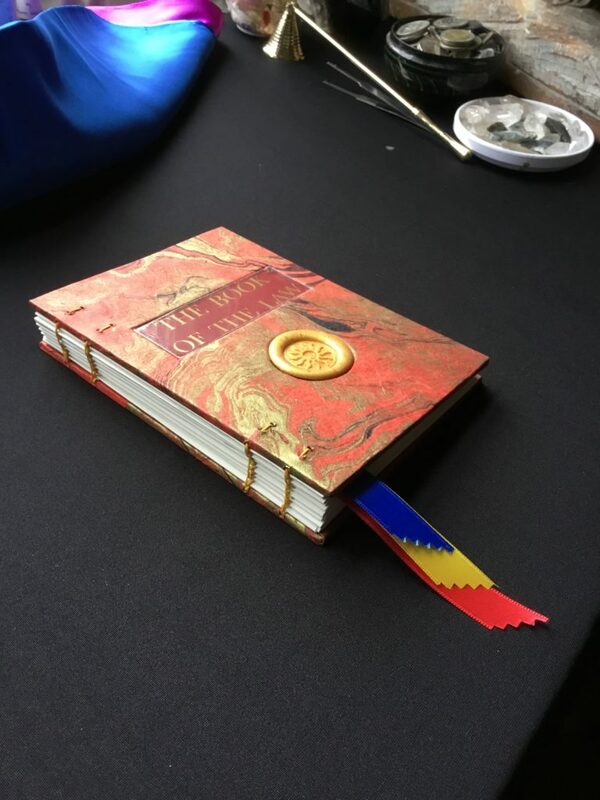 It has ribbon bindings in elemental colors for each of the three chapters, and each side of the stele on the inner covers. These kind of books are fun to make but they take a lot of time. I want to make another one when I have time. Which may not be for a while as my art time is going towards painting. 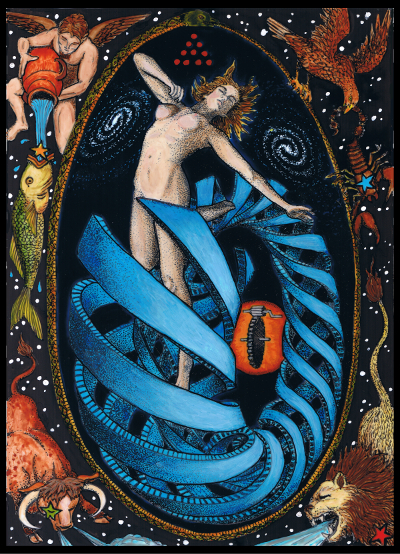 Also speaking of the holy books, here is a site that will answer your question with a Bibliomancy selected from one of the Thelemic Holy Books. It gives spookily appropriate readings. 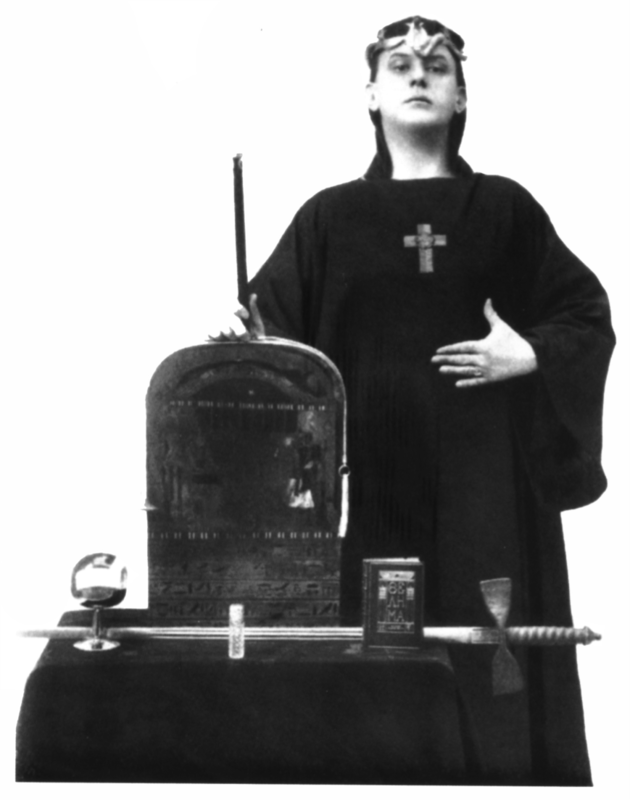 From what I gather the proper Crowleymas celebration includes a lighthearted or humorous component, and perhaps a libation like a special cocktail a la Crowley, and/or a recipe he enjoyed. A quick spin into the vortex of the internet, reveals a Crowley recipe for Riz (Rice) to be served with curry. But Himself does not really give much of a recipe. Just a hint of ingredients and techniques for a pistachio nut rice dish, he calls a “Poem of Spring”, golden from turmeric and green from pistachios, a perfect foil to the ultra hot curries he enjoyed. I can see why he calls it a Poem of Spring, as it is made up of the colors of the Fool. Especially if you use golden raisins. Then it has all the colors of the Fool except Sky Blue so there you go, serve it on a blue plate. 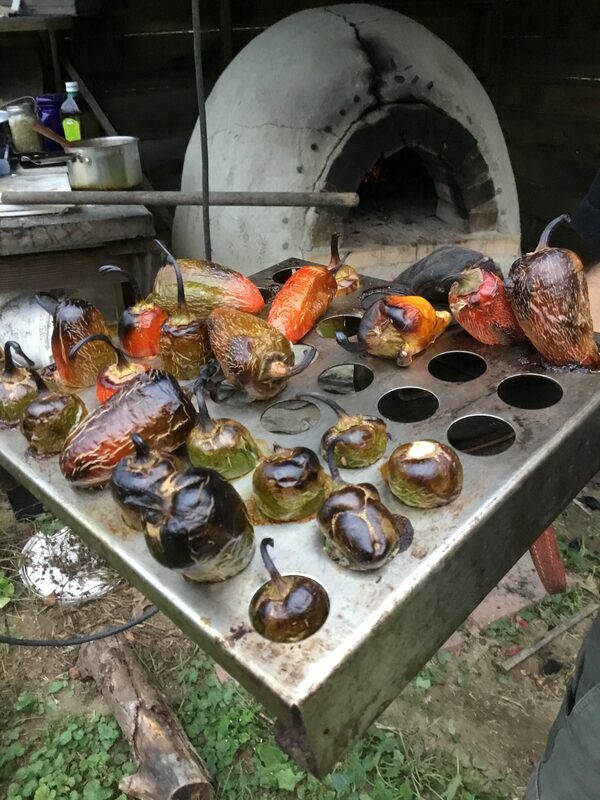 This year I grew lots of different types of fragrant hot peppers so they will be incorporated into a main curry dish somehow. Since it is Friday, day of Venus, perhaps a Fish Vindaloo, or an an Eggplant Tindaloo or Phaal (two of the hottest curry types) served with a modern quinoa of the new aeon. Violet cordial litmus test. Glass on the left has acid added (lemon) which makes the color change. The Crowley cocktail recipes that Sir Internet gives up are a bit much for a week night, or even a Friday, involving such extraordinary ingredients as strychnine and ether and laudanum, as well as various boozes. 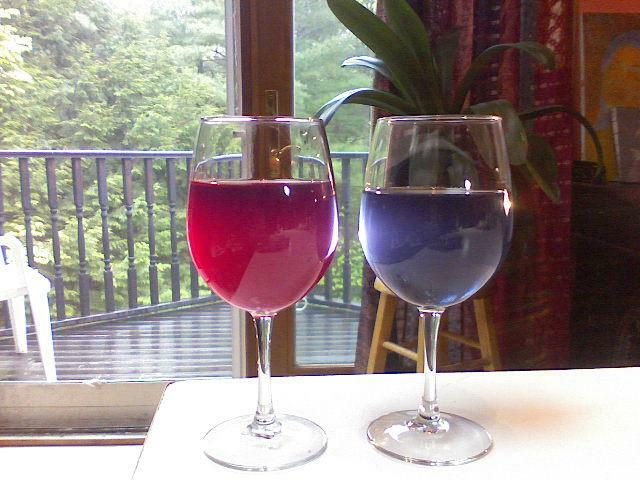 In years past I have made my own “Debauch” cocktail for this day, but that too involved absinthe mixed with my own exotic home made elixir, made from hundreds (or thousands) of tiny violets, hand harvested and made into a litmus paper like color changing liquor. It would change from bright blue to violet upon the addition of acid. No kidding! Alas, last spring (or has it been two?) I neglected to get down on my hands and knees in tick and black fly season to pick hundreds of tiny flowers. So no violet liquor this year. It takes a certain fortitude to make. So this year I will have to improvise with what is available. Something with either absinthe, good brandy, British gin, or good scotch, all of which seem like possible favorites according to his nature and biography. Maybe the oldest American cocktail, originating in New Orleans and incorporating an absinthe rinse (the Sazerac.) Perhaps garnished with a sliver of Habanero and a coca leaf, because it is Friday night after all. Stir scotch and bitters with ice, add tea bag and stir again,. .wash chilled cocktail glasses wirh absinthe, add cardamon pod and lemon twist. Serve with spicy food, and try to remember existence as pure joy. So, what’s up with the new deck? That is a beautifully bound book. I’m astiunded with all you do with Crowleymas! Itis good to have occasions as such to dig into what you love! With love under will.